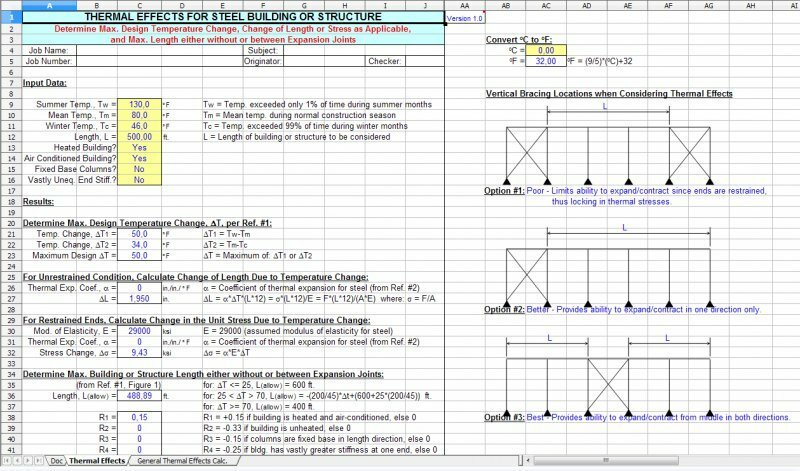 THERMAL is a spreadsheet program written in MS-Excel for the purpose of considering the thermal effects for a steel building or structure. Specifically, the appropriate maximum design temperature change, the change of length or stress as applicable, and the maximum building or structure length either without or between expansion joints is determined. There is also a "General Thermal Effects Calculator" which can be used to selectively determine any of the analysis parameters, as well as a temperature converter which can be used to convert from oC (Celsius) to oF (Fahrenheit). 2. 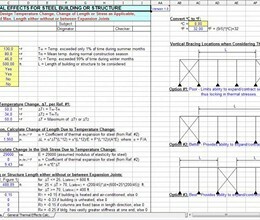 This program uses the recommendations from Section II.A of Reference A (from above) to determine the appropriate maximum design temperature change, DT, expressed in oF. This value may then be utilized in either a 2-D or 3-D computer analysis model to determine the overall effects of the temperature change on the building or structure. 3. This program uses the criteria from Section II.B.1.a of Reference A (from above) to determine the need for building or structure expansion joints. * THERMAL download link provides freeware version of the software. THERMAL has been rated 4.0 out of 5 points. A total of 1 votes cast and 0 users reviewed the software.